Three beliefs about globalisation have propagated since the early 1980s. First, that globalisation leads to a reduction in global inequality. Second, that high income growth among the richest will lift the incomes of the poorest. Third, that there is no alternative to rising inequality without turning our backs on trade and technology. The recently released World Inequality Report dispels these notions. Globalisation has led to a rise in global income inequality, not a reduction. Since 1980, income inequality has increased rapidly in North America, Russia and Asia, grown moderately in Europe, and stabilised at an extremely high level in the Middle East, sub-Saharan Africa, and Brazil. At global (aggregated) level, inequality has risen sharply, despite strong growth in China. Income doesn’t trickle down. Are we sure that the enormous rise of the global 1% was necessary for the growth of the bottom 50%? Answer: Nope. To understand this is key, because the idea is still rooted in a number of current policies, e.g. that high income growth for rich individuals is a precondition to create jobs and growth at the bottom which is used to justify tax reductions for the richest, as seen in recent tax reform in the U.S. and France. Policy – not trade or technology – is most responsible for inequality. Economic inequality is largely driven by the unequal ownership of capital, which can be either privately or public owned. Since 1980, very large transfers of public to private wealth occurred in nearly all countries, whether rich or emerging. While national wealth has substantially increased, public wealth is now negative or close to zero in rich countries. Arguably this limits the ability of governments to tackle inequality. Wealth inequality has not yet returned to its extremely high early 20th century level in rich countries. However, it’s a matter of time. In a future in which “business as usual” continues, global inequality will further increase. 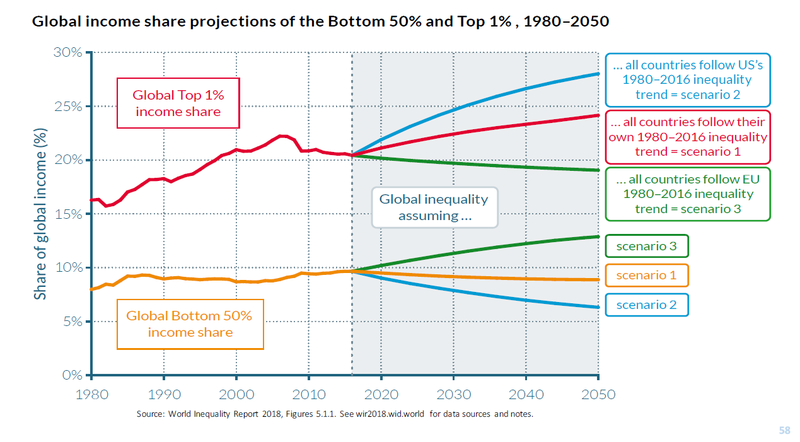 If all countries were to follow the high inequality growth trajectory followed by the United States since 1980, the global top 1% income share would rise even more, to around 28% by 2050. This rise would largely be made at the expense of the global bottom 50%, whose income share would fall to 6%. 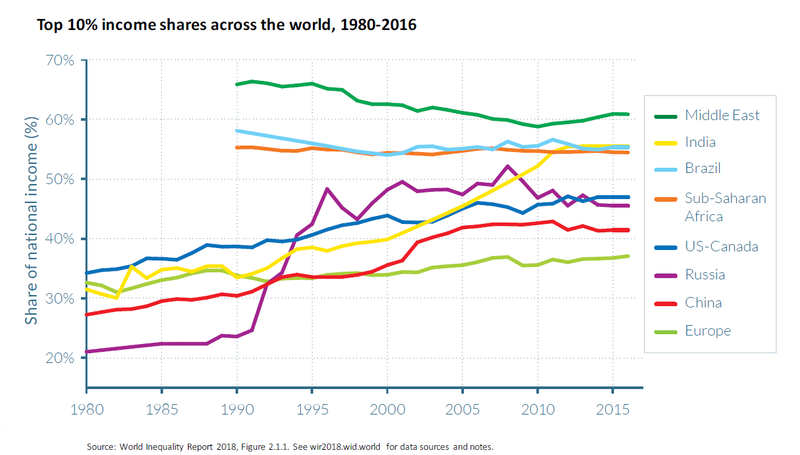 Conversely, if all countries were to follow the relatively low inequality growth trajectory followed by Europe since 1980, the global top 1% income share would decrease to 19% by 2050, while the bottom 50% income share would increase to 13%. The aim of the World Inequality Report 2018 is to contribute to a more informed public discussion on inequality by bringing the latest and most complete data to all sides in this global, democratic debate. And the analysis is truly impressive. Unfortunately, I would say that the recommendations to tackle global income inequality are not so sharp. From a global financial register recording the ownership of financial assets to more equal access to education and well-paying jobs, they seem more beautiful expectations rather than a practical action plan. Maybe I am becoming too mistrustful, but it seems that there is still plenty of room at the top.